How to collect beetles for DNA studies? Preserving beetles for DNA studies is easy, but a few rules need to be followed. You will first need to decide which specimens to preserve. It is ideal to have two or more specimens of a species preserved, so that the extra specimens can serve as backups in case the first specimen fails to yield good DNA. Also, because the specimen from which DNA sequences will be obtained serves as the voucher, it is important to choose the gender that contains the key morphological characters for distinguishing species. This will allow the DNA data to be properly associated with the morphological data, type specimens, etc. For Bembidion, males contain the most diagnostic characters, and so males should be preferentially preserved for DNA. The general rule of thumb is that whatever gender is best for a holotype is the gender you should choose for DNA preservation. Exactly how a specimen should be preserved depends upon the materials you have available. I use one of two preservation methods: in 95-100% ethanol, or in silica gel. One of the most important things that both of these do is to remove water from the beetle’s tissue, which prevents nasty enzymes from destroying the DNA. Here are some procedures I use to ensure high-quality DNA. 95-100% ethanol is ideal; lower concentration doesn’t work as well. Drop the live beetles into ethanol. Make sure there aren’t too many beetles in the vial; ideally there is at least four times as much ethanol as there is beetle mass. 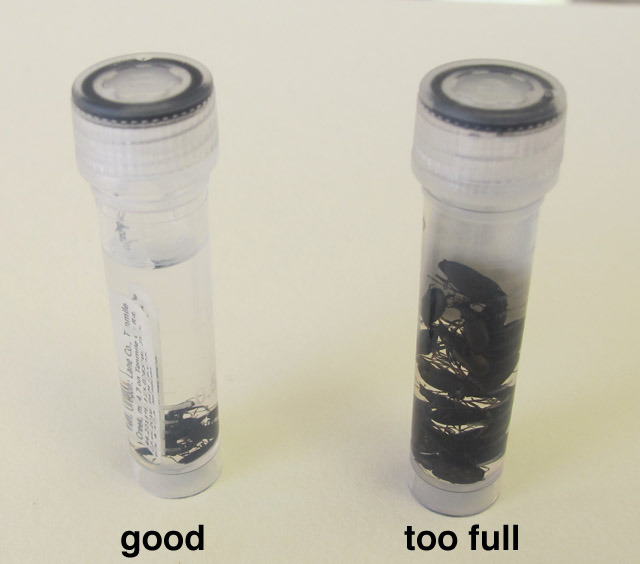 The vial on the left below will have well-preserved DNA; the vial on the right is too tightly packed with beetles, and the DNA won’t be as high quality. Once the beetles have all died, it is ideal to pour off the ethanol and replace it with fresh ethanol. If you can’t do that right away, that’s OK; but you should change the ethanol in the next day or two. If you can change the ethanol again a few weeks later, that would be even better. 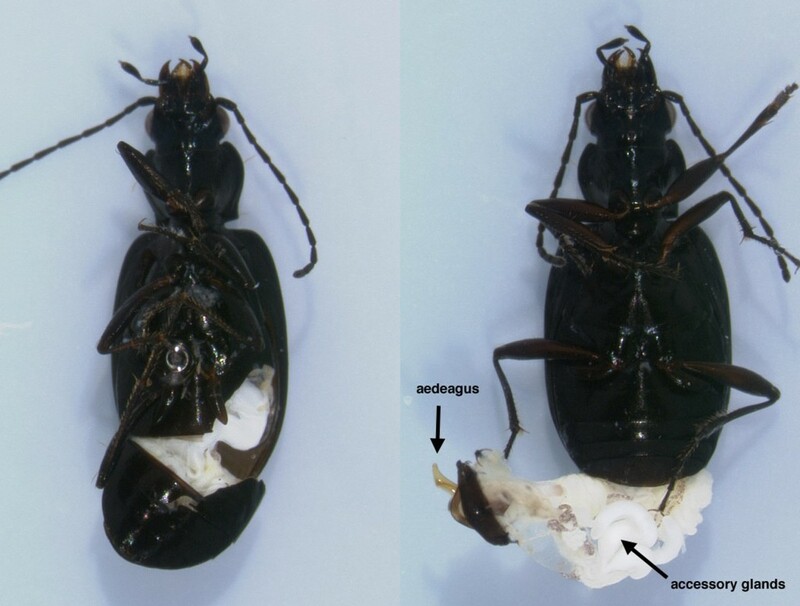 It can also help a great deal to open the body of the beetle up so that ethanol can penetrate, especially if the specimen is large or has a very thick cuticle. When I collect, I usually open up one or two specimens this way (and preserve a few other specimens whole, without opening them up), to ensure that at least those specimens will have excellent DNA. The simplest way to do this is to hold the specimen between the thumb and forefinger in one hand, such that the abdomen is exposed, and take forceps and gently pull the abdomen slightly off, as shown below. It is best if you don’t take the abdomen off completely; that way, the abdomen is kept associated with the forebody. The advantage of a dissection like this is the specimen can then have the soft tissue removed for DNA extraction, and the rest of the body is in great shape for a morphological specimen. If I want an even better morphological specimen (for example, for a holotype), after the dissection I pull off the soft tissue and put it into ethanol, and put the body into sawdust and ethyl acetate (with labels to associate the two pieces, of course). Finally, the specimen should be kept as cool as possible; if you can keep it in a fridge, or a non-defrosting freezer, the DNA will be better preserved. While this is the ideal approach, most specimens will be well preserved if you just do the first three of these. Certainly, if you can only manage the first three of these, that is much better than no specimen at all. If you don’t have 95-100% ethanol, an alternative that I have used successfully is to boil the live beetle in water for 30 seconds, and preserve it in 80% ethanol. The DNA seems to be OK in 80% ethanol for at least a few weeks if it is boiled first. Another approach is to preserve specimens with silica gel. This yields very good DNA, but very brittle specimens that break in pieces. Prepare each vial in advance by filling it half-full of dried silica gel. It is ideal to use indicating silica gel that changes color when it absorbs water; this allows you to see if the silica gel is still good, as it must be very dry to work well. (If it has changed color because it has absorbed water, you can dry it out by baking it in an oven.) Put a cotton plug on top of the silica gel to hold the silica gel in place in the vial. (Without the cotton plug, the silica gel will roll around and destroy the specimen.) Tighten the lid, and the vial is ready for use. To preserve a specimen, open up the prepared vial, and put one to three live specimens in the top of the vial, above the cotton plug. Add whatever label you wish to use, and then close the lid tightly. 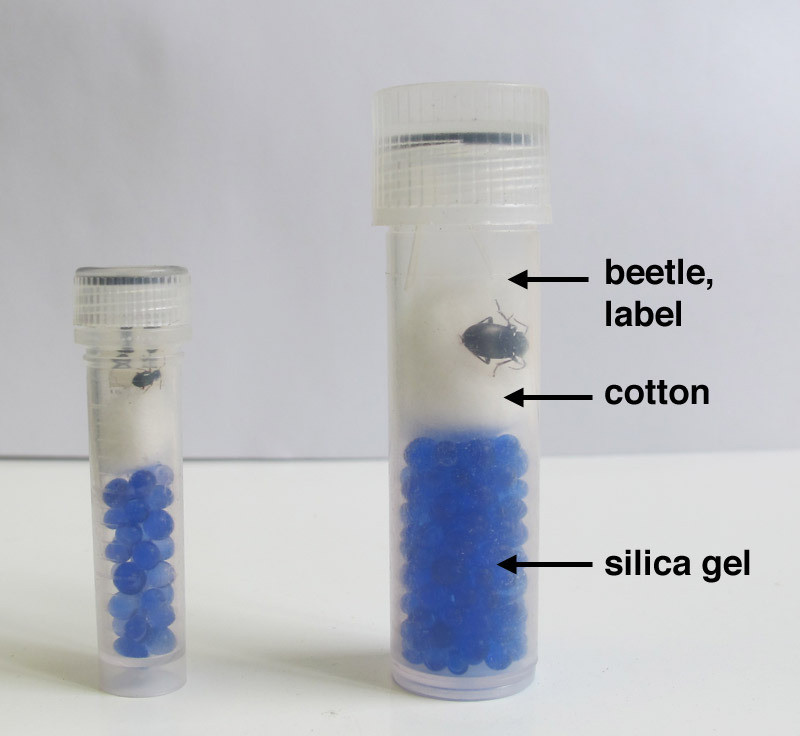 The silica gel will dry out the beetle and preserve the DNA. The larger vial is about 65 mm long (with the lid on) by 15 mm wide, and is available from Sarstedt (their catalogue number 60.542.007). 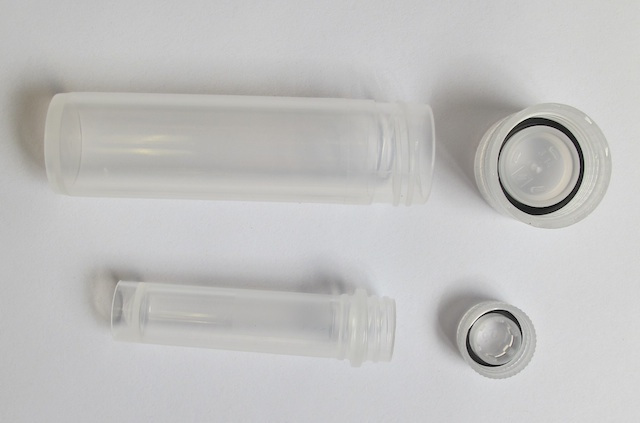 The smaller vial is 46 mm long by 11 mm wide, and is available from USA Scientific (their catalogue number 1420-9700). UPDATE: Kip Will notes that he uses a slightly different procedures for the much larger beetles he works on. He twists them at the prothorax-mesothorax junction and break them open there so the ethanol can penetrate. For the larger specimens he changes the ethanol three times. If they are >25mm then he puts a leg or two separately into ethanol.